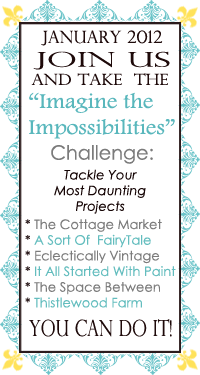 Last week I talked about my commitment to the “Imagine the impossibilities,” challenge. I had decided to start, and finish my wedding scrapbook. I’ve been plugging away steadily since then, and its time to share my progress! Boy have I had a hard time at it. No wonder I thought this was impossible! The first step was to wade through over 500 pictures from our AMAZING wedding photographer, and choose the ones I wanted to use. I use Google Picasa to organize the photos, so aside from the amount of time it took, this part was pretty easy. So, armed with 231 digital files in a folder on my 20gig flash drive I set off to a one-hour photo. Well, turns out those machines read EVERY image. Not just the ones in folders you select. (How was I to know!?) So, 20 minutes of loading later, I was ready to print. Hubby and I went and got dinner, and came back to pick up our prints. It was at this point we realized we had forgotten the photo release form. And the printer would not sell us our photos without it. ::sigh:: So, we hiked it all the way home and back with the release. But when we got back, the one hour photo was closed. ::double sigh:: Thankfully a neighboring department was able to assist, but he was clearly not well versed and the whole 2nd trip took more than 40 minutes. That’s when I realized I didn’t have enough pages. No big- right? Order some that match. Oh wait! 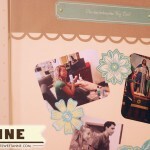 My scrapbook (due I’m sure to my procrastination) is so old its discontinued. So I went to the scrapbook store and got some coordinating background papers. 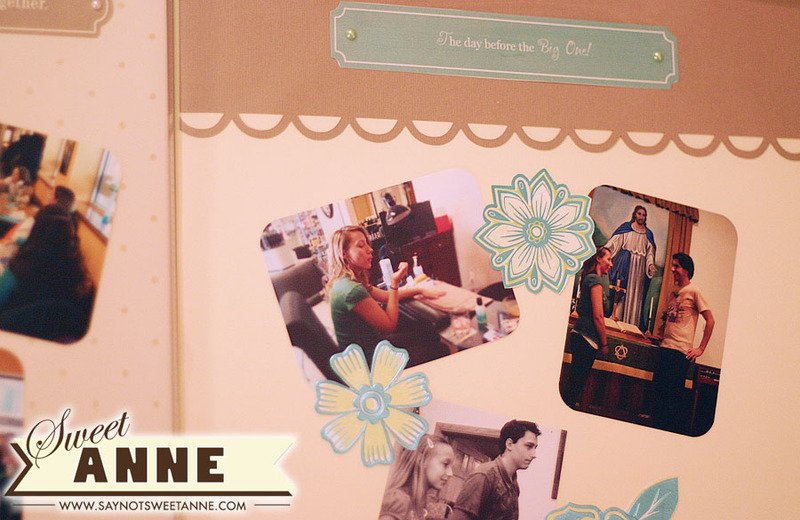 That brings us to where I am now; methodically using the backing papers I bought to construct layouts that look like the original scrapbook design. Its actually been pretty fun! I made some “labels” to match the ones that came with- (they say things like, “The day before” and “Love chose us”). 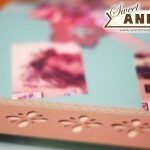 And I used my new Silhouette Cameo to cut out some interesting pieces to complete the layouts. Oh! And don’t forget the card bits I cut out! So, I’m all of 5 pages down. About 25 to go. I keep plugging away! To start out, I just slid the photos into the sleeves of the pages I wanted them to eventually live on. I tested a couple of colors until I found one that matched the other titles. I even found similar fonts and mimicked the first letter swirly effect. 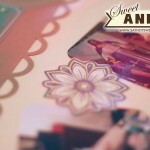 I used my Silhouette Cameo to cut embellishments to match those already included in the book. 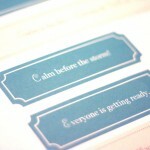 Some of the lovely elements I cut out from weddings cards. This is one of the pages I built from scratch. 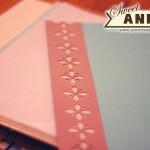 Notice the title and the brow paper embellishments that I made to match the pre-built pages. Looks like you’re way on your way to completing your impossibilities challenge. I definitely like how your album is turn out. I’ve committed to a challenge as well. Good Luck on completing it! Kayla! Your are coming along great. I would get so distracted going through all of the wedding photos and forget about the project. I bet it’s been fun, even though time consuming. And too funny about the photo printing experience. Lesson learned I guess!! You are hard at work! I’ve been painting all day. I don’t think I’m going to be able to move tomorrow! I am so impressed with your progress! You go girl! I can’t wait to see the finished album! Thanks for joining us for the challenge.